No two churches are identical in size, shape, or service. By the same token, the dimensions and nature of events typically held in an arena will dictate the necessary arrangement of the loudspeaker components. Each project requires considerable attention to identify the ideal audio setup for any given space. Certainly, common approaches will exist for spaces that share similar characteristics. However, deciding on a certain approach does not happen without intensive analysis prior to the first wire being pulled. The First Baptist Church in Jackson, TN is an example of Internally Sound's usage of JBL's VRX Series portable line array systems. Until recently, scalability has been an issue regarding line arrays as not practical options for smaller venues. But here, a total of 11 JBL VRX932LA loudspeakers were used with one cluster of four directed toward the front of the church, along with clusters of three on each side and one in the back. In a development so obvious it often seems lost on the general public, the presence of high-fidelity, high-impact audio systems is more widespread in the number and variety of applications than ever before. Virtually any space where people gather is probably in need of an effective sound system to address-or entertain-the masses. Houses of worship, lecture halls, arenas, stadiums, retail outlets, casinos, transportation hubs, hotels, and restaurants are just a few of the countless growth areas for systems integrators. Companies like JBL Professional have developed their product lines with the goal of providing systems integrators with ideal loudspeakers for applications of all sizes. With this in mind, let's examine the most effective approaches to audio system installations, from large to small. Representing the considerations for larger arenas is Demetrius Palavos. He is the director of engineering and production for Pro Media, based in Hercules, CA. There are many challenges associated with a project of any size. In one sense, the size of the venue is not really an issue as all projects require the same level of detail and timeliness. That said, with larger venues, more time and resources are required to engineer, project manage, and install. The biggest challenge with any size project is to fully understand the client's needs and expectations and how that relates to the budget. As technology becomes a more integral part of our daily lives, the client/audience expects a great audiovisual experience. Delivering on these expectations requires managing the clients' expectations and educating them on the complex issues involved. In most cases, the original design is based on the owner's design criteria, but is then superseded by the "real" budget. With the client wanting more than their budget can support, the issue then becomes what to remove from the design, how will it impact the client's expectations and how it will affect the performance of the system. A typical multi-use arena sound system design will comprise of a main cluster with subwoofers, scoreboard fill, dasher horns and delay fills with amplifiers (which have some type of control software), and signal processing. When it comes to budget shortcomings, it may not be possible to include all of these sub systems in the installation. So, it is important to look at the use of the facility's current events to help the client really evaluate the design on the needs for "today" and not for the "tomorrow" scenario. However, the caveat to this approach is to leave enough flexibility in the system to allow for subsequent sub-systems to be added to the design, thus addressing future needs. For example, let's assume the facility does not have a hockey team or arena football but one day hopes to have one as a tenant. The client could then consider removing the dasher horns from the design and trim $20,000 to $25,000 in equipment, labor, and engineering costs from the budget. Another possibility would be to have the main clusters based around a well-designed loudspeaker, which has good low-frequency performance, enabling the client to delete the subwoofers from the design and again cut costs. An example of this would be the install Pro Media completed at Fresno State University Save Mart Center. The final budget was greatly reduced and we worked closely with the sound system designer, WJHW, to put together a solution which would meet the budget while maintaining a level of performance that the client would be happy with. The final sound system configuration was based around a four-cluster design with 28 JBL PD764 loudspeakers (the sideline arrays consisted of four over three over two and the end zone clusters had three over two), with 28 JBL AL6125 low-frequency modules located at the top of each array cluster (eight for the sideline clusters and six for the end zone clusters). Even though the design had to change due to budget constraints, the team effort by WJHW and Pro Media allowed us to design a sound system that met the client's expectations and final budget. Even though the subwoofers would have been nice to have in the final design configuration, the products selected really worked out great, and the way the system was designed (rigging, rack space, signal processing topography, cabling, infrastructure) enables the client to add subwoofers in the future with relative ease. As stated earlier, the key to a successful project is to spend the time at the beginning of the project to truly understand your client and educate them on the complexity of these systems in facilities of this size. The goal is to make the client happy and have an end product that you can be proud of. On behalf of the smaller-scale jobs, particularly churches in this case, Phil Jenkins speaks about his experiences. Jenkins is president of Internally Sound, based in Milan, TN. As a systems integration firm specializing in small to medium-size houses of worship, we have made a point of working very close to home-geographically. The majority of our projects are an hour away or closer to our main offices. This not only allows us to maintain a high concentration of business in our immediate area, but also enables us to stay in close contact with our clients at all times. Smaller churches have a tendency to change their minds the closer they get to the project's completion, because it's often difficult to picture all the variables of a given project prior to its onset. Because of this, our challenge is to constantly keep the church directors abreast of our operations so there are no surprises at the end. I'm a big fan of state-of-the-art technology, but when it comes to smaller installs, it's also important to keep things simple. Every microphone and every input is labeled. Once the project is completed, we always make a point of educating the technical director, music director and choirs on the technology. We also check in with them during the week to make sure there will be no major issues come Sunday morning. Even so, the occasional Saturday evening phone call happens where I need to come to the church and make a last-minute adjustment. Honestly, if you want a nine-to-five, Monday-to-Friday job, don't work with small churches. But I love knowing that we're making a difference in people's lives, which drives everyone in our company. With respect to the design of these systems, I've found that line array components provide key advantages in coverage and power. Until recently, however, scalability had been an issue because line array systems were not practical options for smaller venues. However, we have performed a number of installs over the past year utilizing JBL's VRX Series portable line array systems. 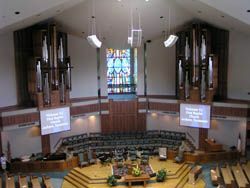 Just one example of this is the First Baptist Church in Jackson, TN, where we hung a total of 11 JBL VRX932LA loudspeakers. One cluster of four is directed toward the front of the church, with clusters of three on each side and one in the back. There are plenty of companies who will meet the low-price demands of prospective clients all day long. At Internally Sound, however, we want to look into the future. With digital technology, you can always add in other components after the initial installation. We are able to meet the needs of the clients while leaving the door open for further system expansion later on. The up-front costs may be a bit more than the lowest bidder, but the technology we install will save money in the long run. We also save money by running a tight operation. In addition to myself, my brother Mark tunes every system at the project's completion, while my daughter Joy handles a number of tactical on-site operations.